A 33-year-old male patient presented with a 1-year history of asymptomatic, well-defined, systemic involvement, diameter of 2 - 6 cm, irregularly-shaped erythematous plaques (Figure 1). The lesion gradually enlarged and firm nodules developed within the plaques, higher than the skin. The nodules, which situated at two armpit and left groin, had normal color and skin temperature. There were no pain, itching, ulceration, intermittent fever, night sweat, weakness, chills, cough, stomach ache, diarrhea, frequent urination and joint pains. Gradually, these erythematous plaques spreaded to two sides of thighs, and the nodules at left armpit and left groin enlarged to the size of egg. The weight went down by 5 kg in the past 4 months. Figure 1: Erythema on the back. Punch biopsy was made on indurated plaques at left armpit and pathological specimen showed detection of the two gray thread tissues, which was 1 - 2 cm long. Immunohistochemistry presented CD3(+), CD5(+), CD20(-), CD79a(-), Ki-67, 60%, TdT(-), CD10(-), Bcl-6(-), Cyclin D1 (-), CD138(-), MUM1(-), ALK(-). At the same time, skin biopsy on chest wall was made and a sample of 1.5 cm × 1.0 cm × 0.7 cm was taken. 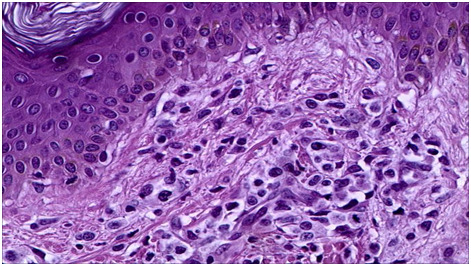 Dense infiltrates of non-epidermotropic, around skin tissue attachment, large lymphoid cells were observed (Figure 2 & 3). Immunohistochemistry showed CD3(+), CD5 dispersion (+), CD20(-), CD79a(-), Ki-67(-), TdT(-), CD10(-), Bcl-6(-), CyclinD1(-), CD138 dispersion (+), MUM1(-), mitochondrial enzymes B(+), TIA-1(+++), CD4(++), CD8 dispersion(+), CD30(-), CD56(-). Special staining: acid-fast staining (-). Bone marrow smears: normal. Abdominal ultrasound revealed intraperitoneal, retroperitoneal non-Hodgkin’s lymphoma (7.4 cm × 3.9 cm, 9.8 cm × 9.9 cm, 9.8 cm × 7.5 cm, hypoechoic masses were detected in liver and kidney clearance, spleen and kidney clearance, behind the abdominal aorta). Non-Hodgkin’s lymphoma infiltration of the liver? (8.6 cm × 4.9 cm, less-defined hypoechoic masses were detected in the right hepatic lobe). Superficial ultrasound: maximum size of 1.4 cm × 0.6 cm, 2.2 cm × 0.9 cm, 3.8 cm × 2.2 cm, 2.1 cm × 0.8 cm lymph nodes were significantly in bilateral submandibular, bilateral neck, bilateral axillary, bilateral inguinal. Other inspections and examinations showed unremarkable. Figure 2: Skin biospy (HE stain, X100). 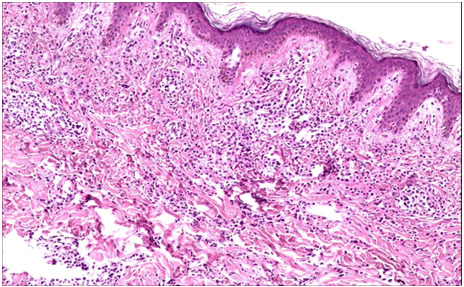 Dense diffuse infiltration of markedly atypical large lymphocytes throughout the dermis to subcutis. Figure 3: Skin biospy (HE stain, X400). Most lymphocytes are large with irregular shapes and sizes showing hyperchromatic nuclei and frequent mitoses. The patient was diagnosed as non-Hodgkin’s lymphoma, anaplastic large cell lymphoma, stage IV group B and received systemic chemotherapy strategies of VELP, enlarged lymph node obviously reduced, erythematous plaques shrinked. Subsequent chemotherapy strategies of three VELP showed certain effect. Erythematous plaques nearly disappeared and enlarged lymph node significantly shrinked. Further treatments were still executed. Anaplastic large cell lymphoma (ALCL) is a rare type of mature T-cell lymphoma accounting for approximately 2% - 7% of all non-Hodgkin’s lymphoma(NHL). ALCL was described as a type of lymphoma characterized by CD30(+) and pleomorphic large cell hyperplasia which was first proposed by German pathologist Stein in 1985. ALCL was divided into two groups by World Health Organization (WHO): Primary cutaneous ALCL (PC-ALCL) and Primary systemic ALCL (PS-ALCL). Generally, PC-ALCL is a rare type of primary cutaneous lymphoma, comprising only 0.9% of all primary cutaneous malignant lymphoma, which is belonged to primary cutaneous CD30(+) T-cell lymphoma proliferative diseases. PC-ALCL doesn’t express anaplastic lymphomakinase (ALK) and is characterized by the absence of systemic involvement. It was reported that ALK was rarely positive in PC-ALCL, and ALK positive suggested that there may be potentially systemic involvement. The occurrence ratio of male to female is about 1.5 - 2.0:1. PC-ALCL is more common in adults, and it is more likely to occur in men over the age of 50 and clinically characterized by solid nodules, plaques, lumps at single and multiple limb as the initial presentation, which mostly gathered in the dense distribution of more than 1 cm in diameter of pink or purple patches and can be ruptured and form ulcers. Histopathology showed a larger size of tumor cells to big giant tumor cells, tumor cells might invade the dermis and subcutaneous tissue. The clinical manifestations and histopathological and immunohistochemical examination were used as diagnosis basis. As a young man, our patient’s torso, armpits, groin and other parts were distributed a plurality of sheet-like red or purple patches. These appearances were considered as lymphoma. The rare case in clinical were considered as PC-ALCL based on these, intraperitoneal and retroperitoneal ultrasound prompted non-Hodgkin lymphoma two different parts of the diseased tissue biopsy prompted lymphoma cell volume increased significantly. Immunohistochemistry was CD3 (+), CD5 (+), CD30 (-), excluding lymphoma papulosis, fungal infections or other special medical history. PS-ALCL should be differentiated when we diagnose PC-ALCL. PS-ALCL is the most common subtype of ALCL, whose occurrence ratio of male to female is 1.6 - 5.3:1. The high occurrence age of PS-ALCL showed bimodal distribution. The first peak is about 20 - 30 years old; the second peak is about 40 - 50 years old. The disease involved surface lymph nodes, followed by the neck, groin, armpits, retroperitoneal, later also involving the bone marrow, bone, respiratory tract, gastrointestinal and soft tissue. Treatment for PC-ALCL and PS-ALCL is the same, and ALK (+) PS-ALCL had significantly better prognosis. In addition, diagnosis of PC-ALCL should be distinguished with Lymphomatoid Papulosis (LyP), Mycosis Fungoides (MF) and other skin lymphomas. Fortunately, PC-ALCL was sensitive to chemotherapy and radiotherapy. Methods of its treatment included tumor resection, localized radiotherapy and chemotherapy or combination therapy. For localized single PC-ALCL, preferred treatment is radiotherapy. But for multisite presence of lesions or visceral involvement chemotherapy might be a good choice. According to the features of our patients with multiple lesions, preferred program is chemotherapy. After the first VELP regimen, the patient’s lymph nodes were significantly shinked and erythema narrowed than before. Followed by subsequent continuous regular chemotherapy, erythema nearly disappeared and enlarged lymph nodes were significantly reduced in the body leisions. These treatments were significantly effective. In summary, PC-ALCL was concealed and showed slow progress. It was more common in adult men. The prognosis of PC-ALCL is highly relevant with the size of lesions, location, and dissemination or not. For most cases they have good prognosis and the 5-year survival rate is about 76% to 96%. Therefore, appropriate therapeutic intervention used to PC-ALCL can greatly reduce the mortality caused by the disease. And the high recurrence rate of PC-ALCL should be paid high attention to. Although VELP chemotherapy program and continuous regular treatment to our patient is effective and there was no recurrence so far, long-term follow-up is still very important. This work was supported by the grant from the natural science foundation of Gansu Province (145RJZA151). All authors read and approved the final manuscript. All authors declare no conflict of interest. 1. Zhang, Ye., Jin, Jie. Advances Research on Anaplastic Large Cell Lymphoma. (2012) Int J Blood Transfusion Hematol 35(3): 232-235. 2. Stein, H.?Mason, D.Y. ?Gerdes, J.?et al?The expression of the Hodgkin's disease associated antigen Ki-1 in reactive and neoplastic lymphoid tissues: evidence that Reed-Sternberg cells and histiocytic malignancies are derived from activated lymphoid cells. (1985) Blood 66(4): 848-858. 3. Lou, Jin-shu., Gao, Zuowen. General-onset Primary Cutaneous CD30 + Anaplastic Large Cell Lymphoma. (2010) J Clin Dermatol 39(9): 564?565. 4. Chao-Lo, M.P.G. ?King-Ismael, D?Primary cutaneous CD30 + anaplasticlarge cell lymphoma: report of a rare case. (2008) J Dermatol Case Rep 2(3): 31-34.